The designation of a church or shrine as a basilica is indicated by the display of a coat of arms and several important Papal Symbols. The Center back is the Umbrellino associated with a basilica (see below). The crossed Keys relate to the Papacy indicating the Pope’s power to bind andto loose. The chief point of the shield depicts the‎ star with the letter M – a symbol of Mary, the Mother of God. This emblem appears in the dome of the Basilica. Immediately below this upper third is a section (brisure) on which is found the arms of Baron Friedrich Von Steuben, after whom the city of Steubenville is named. This indicates the geographical seat of the Diocese. The field is halved into silver and blue, with a diagonal stripe or “bend” in red. This patriotic theme celebrates the fact that Von Steuben served as George Washington’s chief of staff in the Continental Army. The bottom part, or base point, of the basilica’s coat of arms features two rivers – the Ohio and the Muskingum – which come together in Marietta. At that point, a chalice recalls the first Mass offered in the oldest city in the Northwest Territory on August 16, 1749 by Father Joseph Peter de Bonnecamp, a Jesuit missionary. The motto, “Christ is Among us,” is taken from the Greeting of Peace in the Liturgy of the Eastern Church. Along with the response (“He is now and always will be”), the motto is a reminder of the presence of Christ in the world. The Umbrellino (“little umbrella”) is a distinctive symbol used in basilicas throughout the world. 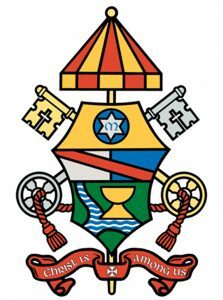 Designed with stripes of yellow and red (traditional papal colors), the silk canopy is a symbol of the Popes authority. During the Middle Ages, the Umbrellino would be carried above the Holy Father during processions. Located in the sanctuary, the Umbrellino remains partially open in as a symbol of readiness to welcome the Holy Father. The panels along the bottom display the Coat of Arms of the basilica, as well as the Coat of Arms of Pope Francis, the Coat of Arms of Pope Emeritus Benedict XVI, and the Coat of Arms of Bishop Jeffrey Monforton, the Bishop of the Diocese of Steubenville. Along with the Tintinnabulum, the Umbrellino was blessed by Bishop Jeffrey Monforton and solemnly placed in the sanctuary of the basilica on the occasion of the Inaugural Mass on November 5, 2013. 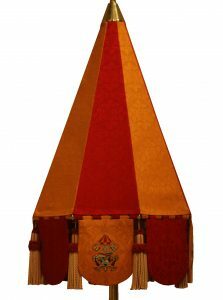 The Tintinnabulum, like the Umbrellino, indicates that the Basilica of Saint Mary of the Assumption has a special relationship with the Holy Father. 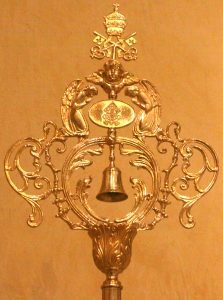 The Tintinnabulum, a bell mounted on a pole, is placed in a Roman Catholic Basilica to signify the church’s link with the Pope. The Tintinnabulum consists of a small gold bell within a golden frame surmounted by the Papal Tiara (the crown traditionally worn by the Pope) and the Papal Keys (see Matthew 16:13-19). Above the bell is a medallion bearing the name of the basilica and the Coat of Arms, flanked by angels. During the Middle Ages and Renaissance, the Tintinnabulum was used to alert the people of Rome of the approach of the Holy Father during papal processions. Along with the Umbrellino, the Tintinnabulum was blessed by Bishop Jeffrey Monforton and solemnly placed in the sanctuary of the basilica on the occasion of the Inaugural Mass on November 5, 2013.